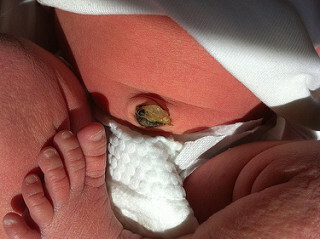 Caring for your baby's umbilical cord stump can be a bit scary to start with. Most new parents will have to take care of their baby's cord stump for a few days, because they tend to come off after about a week, and you will probably be home with your baby before that time comes. Before you go home from your hospital, you will receive instructions about how to best deal with the cord stump but we thought we would give you some tips, too. Iodine is the most commonly recommended product to apply to baby's cord stump to prevent infections. Recent research suggests that a baby's cord stump will drop off earlier if you put nothing at all on there, however. Some mothers decide to use natural cord care, like herbs (witch hazel is a common one), or even honey. Whatever you decide to use, it will help to go shopping for your baby before her birth so that you have the desired product in your home. I used iodine with my first baby, and nothing at all with my second. My second child's cord stump fell off a few days quicker. A cord stump is not unlike an injury, and it benefits from fresh air. If you have a summer baby, exposing the cord stump to air as much as possible is not hard, but it can even be done with newborn babies during winter time. It is important to avoid tucking your newborn's cord stump in with his or her diaper. If you are using disposable diapers, you can simply fold over the front to make sure the cord stump is exposed, and not inside the diaper. Some diapers even have a special hole, so that the cord stump remains free. Cloth diapers may be harder to fold over, but prefold diapers could be your best option, as you can fold them exactly how you want. If you are brave enough, you can even try leaving your baby diaper free for some time each day. Can I cauterise my cyst with a heated needle?